I keep losing my work ID badge, so I finally decided to slip it into the lanyard with my Nerd Herd ID from Halloween and start wearing it around my neck. 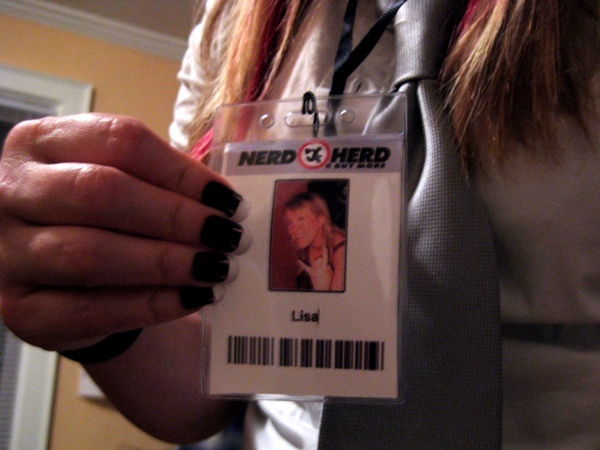 I don’t mind wearing my Nerd Herd badge all day because I’ve pretty much come to terms with the fact that I am, in fact, a huge nerd. I’m not really sure how I feel about this. Is that my claim to fame? I’m good at designing forms? It is true that I designed a form that replaced six other sheets of paper that now accompanies every order that is processed in our company, but I was just trying to save trees. I’ve always striven to be infamous for my overwhelmingly short-lived obsessions with random hobbies, rock star bangs and impeccable taste in music, purses and cheap champagne. At work, maybe my proposal management, writing, or mad computer skills. But certainly not my ability create forms. Hi everyone! Revision G of the [Name of Form] Form is now in effect. Please destroy all copies of Revision F. All orders turned in starting now must be accompanied by Revision G. I sent out several reminders this week, so please don’t call me in tears about your form, and have a great weekend! Now that I think about it, this might be why people at work don’t call me to hang out on the weekends. Maybe.